« Will GOP Fumble Away Guaranteed Sequester Victory? I’ve previously shared some very good “government-shutdown” jokes, and also two superb cartoons on that topic from the 1990s. 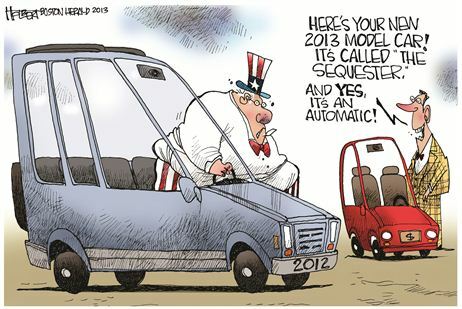 So I guess it was only a matter of time before we got some cartoons about sequestration. But I don’t like most of them because they imply sequestration is a bad thing. 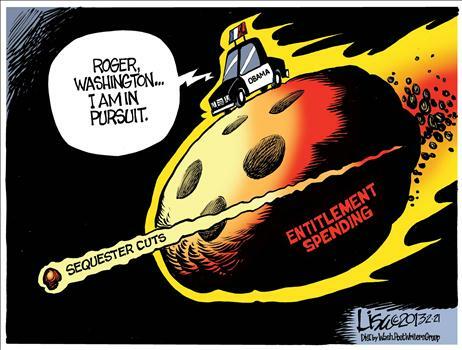 But this Lisa Benson cartoon is worth sharing if for no other reason that it calls attention to the fact that people are myopically fixating on a very small sequester while ignoring a giant long-run entitlement problem. The good news, for what it’s worth, is that the House of Representatives voted for good entitlement reform in 2011 and 2012. So it’s theoretically possible that we may deal with that meteor before it causes a Greek-style meltdown at some point in the future. I also like this next cartoon, produced by Jerry Holbert, because it shows Uncle Sam as a big fat slob. The obvious implication is that government is too big and needs to be put on a diet, with is the same theme we get with this cartoon about redistribution, this cartoon about the VAT., and these cartoons about Obama’s agenda. The problem, of course, is that the sequester is too small. But at least this cartoon suggests that the problem is too much government spending and that Uncle Sam needs to lose some weight. Enjoy, and please share widely. Cutting 2% out of this bloated budget should be no problem. Wow. Where do you even get cartoons like these? I would really like to know. Thanks Daniel for your continued work, been following your blog since the appearance on cnbc mentioning capitalism without bankruptcy is like religion without hell. Love that quote. I am interested though why people fight tooth and nail to prevent a single penny cut from a base line budget \ increase in spending ? Imagine a small business or family running this way, they couldn’t. I sometimes wonder if politicians are making these hysterical claims because if they did go through and heaven forbid we actually do reduce government spending that all of the sudden their narrative will be broken completely. Planes will still fly, police will still be on the street, programs will still run like any other normal day. They really should do a 60 sec video of a normal Joe and his day | hypothetical day before and after sequester cut (entirely the same day) to drive the point home that nothing crazy is going to happen after the sequester falls into place. Well again thanks for all your hard work and placing it out there for people to read. Would you ever want to do a public debate with Paul Krugman ? debate style like lincoln \ douglas debates? I would find it fascinating.